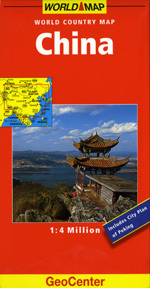 The China maps below have been selected from among many in order to present you with the best maps at the lowest prices. 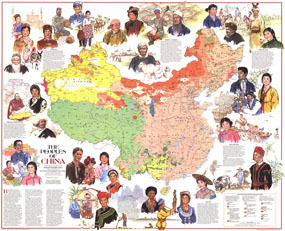 You will find maps of China for a variety of uses including wall maps for the classroom, decorative maps for your home and travel maps to guide on your journey through China. Exclusively developed by Maps.com and GRAPHI-OGRE and not available in any store, this wall map was created using high resolution vector digital imagery with state-of-the-art print on demand technology. 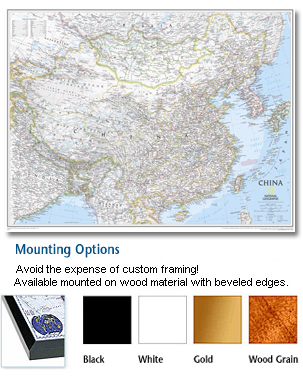 This process allows Maps.com to offer over-sized laminated wall maps. Ideally suited for light reference, this political wall map includes cities, airports, rivers, lakes, and major roads (not numbered). Each province may be individually color-coded. 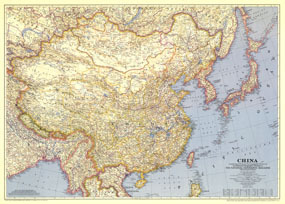 A unique component of this map series includes portions of adjacent areas, bringing an almost regional map feel to a country map presentation. Before purchasing this map click on the Detail Example links next to the preview image above to view the detail typically available on this type of map. Printed on 24lb. premium coated bond paper and laminated on both sides using 3mm laminate through a hot lamination process, this map is markable using dry erase pens and can be easily cleaned. 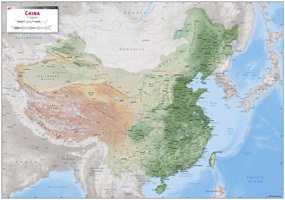 Why settle for a mundane or boring map, when you can get a map that combines usefulness with style This contemporary wall map of China is up-to-date, fully featured, and loaded with detail - literally thousands of places are shown (all in English). 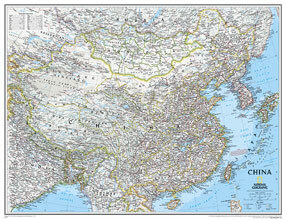 But unlike other maps, this map displays the geography of China with striking aesthetics sure to grab attention. The vibrant colors and intense 3-D mountains look bold and majestic in contrast with the dark background, while the eye-catching border provides the finishing touch on this dramatic map. 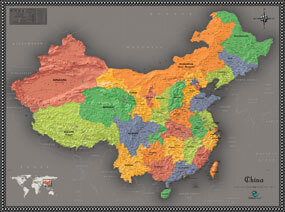 With its functionality and unprecedented style, this contemporary China map is guaranteed to stand out on any wall - whether in the classroom, office, or homeFeatures included on this Contemporary China Wall MapCities State Borders InterstatesHighways Secondary Roads PhysicalTerrain International Borders LatitudeLongitude lines Legend Elevation Info Capitals Insets Coverage Area This China map includes all of China and her neighboring countries. Available here! Known the world over for their detail and accuracy, National Geographic Maps set the standards we have all come to expect. Used by US Presidents and foreign dignitaries alike, these same maps represent exhausting research. NG Maps make great use of color and extensive detail for type placement to aid readability. 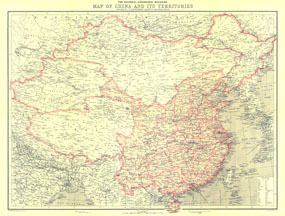 This outstanding China map contains extensive political information, focusing on countries, capitols, and other cities. Political boundaries are presented very clearly, with different color-bands for each country. Whether itÃ¢?Ts international business, the desire to know where events are taking place, or to find the longest river, National Geographic Maps are right for you.